A botanical solution comprised of: purified water, amino acids, minerals and other ingredients derived from leafy green, edible and seed-bearing plants. Spray Household Traditions All Purpose Cleaner on counter tops, stove tops, ovens, refrigerators and sinks and wipe clean. For more difficult areas, let sit for a longer period of time. May also be used as a dishwashing liquid in the sink or dishwasher. Put in soap dispenser or foamer and use for hand soap. Cuts grease, wax and oil. 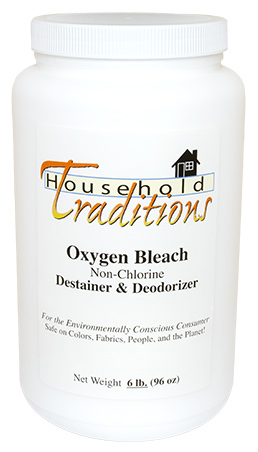 Spray Household Traditions All Purpose Cleaner in the bathtub, sink and toilet. Wipe and rinse. Also spray on soap scum; leave on for several minutes, then wipe and rinse clean. Use 1-2 oz. 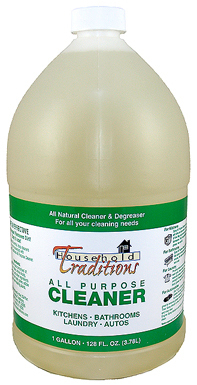 Household Traditions All Purpose Cleaner in 1 gallon of water when washing car. Exterior: For tree sap and tar, spray directly on the area. Let sit for a few minutes, then wash off with water and a clean cloth. Works great for removing grease, dirt & oil! Tires: Spray directly on tires. Let sit several minutes, then gently scrub with a brush and rinse clean. Engine: Spray directly on cool engine. Let sit for up to 30 minutes, then wipe or spray clean. Spray on fruits/vegetables, then rinse clean. Pre-spray stains and spots with Household Traditions All Purpose Cleaner. Use 1-3 ounces in wash cycle. Heavily soiled or large loads: Pre-spray stains and spots. If especially greasy or soiled, allow to soak for at least 30 minutes or even overnight if necessary, then wash as normal. Works great for removing blood, grease, wax, dirt & oil! Spray directly on surface and let sit for several minutes. Scrub with a brush and wipe clean with a damp cloth. Repeat if necessary. Note: Oxygen Bleach is not suitable for use with silk or wool. 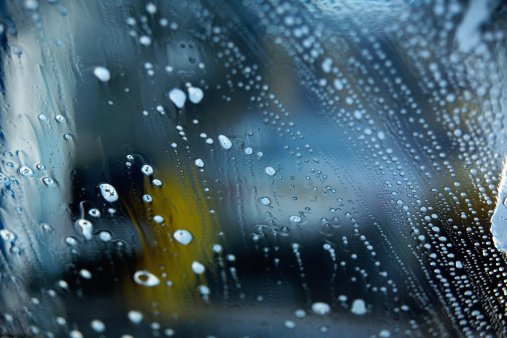 For mildew removal or to clean baseboards or basement floors after water damage from flooding add 4 ounces of Oxygen Bleach to a gallon of hot water, scrub surface, wait 30 minutes then rinse. Oxygen Bleach is safe for use in a closed environment. For railings a hand pump sprayer does a really excellent job. Wait 10-15 minutes. Scrub with a stiff broom or brush, then rinse. 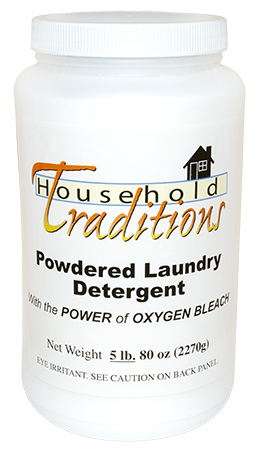 Tropical Traditions Powdered Laundry Detergent cleans and removes stains from your laundry with the power of Oxygen Bleach Destainer and Deodorizer. Powdered Laundry Detergent is safe and effective at ALL temperatures on whites, permanent press, bright colors, pastels, prints, and delicates in hard or soft water. (Not suitable for Silk or Wool) Tropical Traditions Powdered Laundry Detergent is non-toxic, environmentally safe and contains no phosphates. Powdered Laundry Detergent cleans and safely bleaches your clothes with the added power of Oxygen Bleach Destainer and Deodorizer. Powdered Laundry Detergent can be used with Oxygen Bleach Destainer and Deodorizer to provide optimum cleaning and stain removal! Bug Arrest is an ecologically safe and effective pest management solution. It is a non-toxic product containing natural enzymes that devour the exoskeletons of pests such as ants and fire ants, bees, wasps, fleas, flies, gnats, spiders, dust mites, ear mites, hair mites, roaches, termites, crabs, scabies, mange, box elder bugs, lice, and more! It is a botanical solution comprised of: purified water, amino acids, minerals and other ingredients derived from leafy green, edible and seed-bearing plants. There are NO poisons or toxic chemicals in Bug Arrest, and therefore cannot be classified as a pesticide. Spray the insects with Bug Arrest. 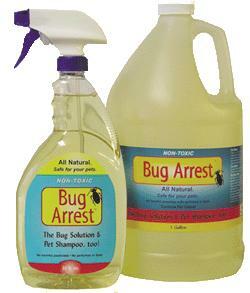 To be effective, Bug Arrest must be sprayed directly on the insect. For items such as furniture, carpets, helmets, and car upholstery, put 2 oz. of Bug Arrest in 16 oz. of water and spray area that may be infested. Allow to dry and vacuum. Place vacuum bag in a sealed plastic bag and remove it from the house. For removing mites on carpets, use 1-2 oz. of Bug Arrest in carpet shampooer. Dilute 1 oz. in 16 oz. of water. Spray plant and soil. Caution: If Bug Arrest is mixed too strong, leaves may burn and turn brown. Try it on a couple of leaves and wait several hours to see how the plant responds to the mixture. If it is too strong, increase water and repeat the process.